The book is in the final stages of publication, and barring any setbacks, The Women’s Football Encyclopedia should be ready for release within the next ten days. Woo hoo! Obviously, I think every fan of women’s football will want a copy of this book. But don’t just take my word for it…excerpts of The Women’s Football Encyclopedia have already found their way into the hands of a few folks around women’s football, and the response has been incredible! Here are a few prominent reviews of the book before its release. This book is a fantastic project, because for those of us who played women’s football for the strict love of the game and the hope that we were in some way helping to shape the future, it’s a delightful, refreshing thought to know that our efforts were not in vain. I love it! This book blew my expectations away, by far. This encyclopedia is loaded with accurate statistics, and the level of detail is amazing. It’s impossible to appreciate the huge strides women’s football is making today without understanding where we started. The Women’s Football Encyclopedia recognizes the thousands of pioneering women of the gridiron who have lived out their dream to play football. This book is unbelievable and truly a gift to women’s football. Thank you to Jen Welter, Coach John Konecki, and Lisa King for their encouraging words! But what about you? Would you like to take a look at the book as it hits the press? 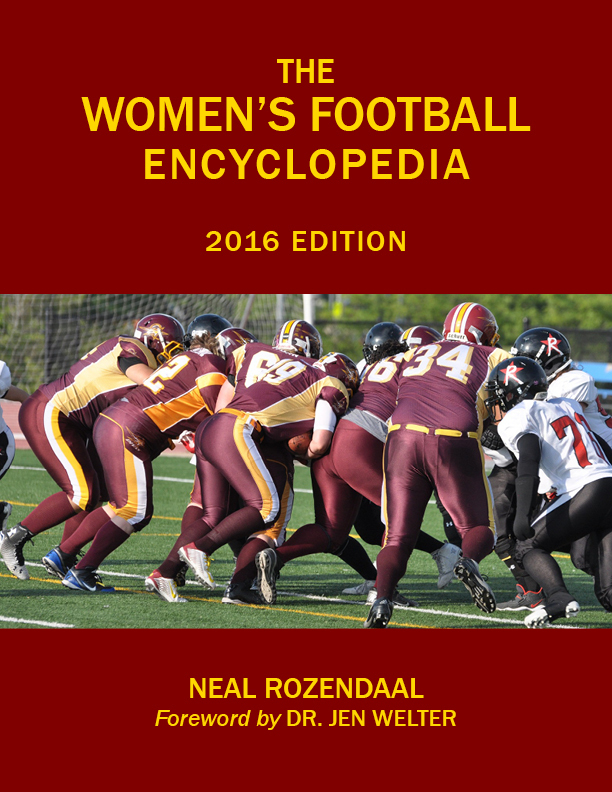 Well, I’ve got good news…in my next post, I’ll let you take a look at a few excerpts of The Women’s Football Encyclopedia, and you can see what all the buzz is about! Until then, stay tuned, and thanks for reading!